The work reveals the physical framework and materiality of the Internet, a vast network often thought and spoken about solely in abstract terms. Taking New York City as its central focus and interwoven with a fictionalised narrative, the film observes the evolution of architecture in the city to accommodate the material nodes and connectors that comprise the physical manifestation of the “virtual” world. New York is home to many of the great buildings that symbolise nineteenth and early twentieth century industrial capitalism. Today, it is significant that a number of these Art Deco skyscrapers – located predominantly in the Financial District – have become the containers for the infrastructure of the Internet and virtual capital. These grand monuments of brick and steel are now homes to the servers and computers that drive post-industrial automated finance capitalism. 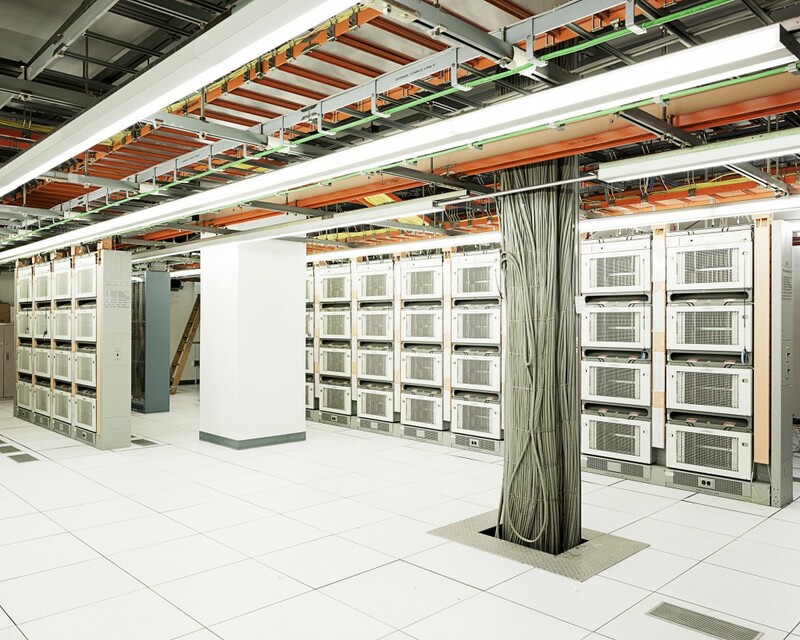 Highly elusive yet pervasive in their nature, data centres consist of room upon room of copper and fibre-optic cables, computer servers and ventilation systems. With direct links to the companies they serve, these Internet hubs become a kind of unofficial space for trade. Divided into three chapters – “Metropolis”, “Servers” and “Flood”, the film moves from inside the structures to the wider city above. Filmed both during and post Hurricane Sandy, in the final chapter “Flood”, the film bares the impact of this disaster, pointing to the constant collision between nature and machine. Emma Charles (UK), studied MA Photography at the Royal College of Art (2011-2013) and BA (Hons) in Editorial Photography from the University of Brighton (2006-2009). Working with both photography and moving image, her work explores metropolitan spaces of productivity that are hidden from the public eye, primarily focusing on the more ethereal and abstract elements of industry and corporate environments. Charles was recently commissioned for solo show Surfaces of Exchange, Jerwood Visual Arts Project Space, London (2014). Recent Group exhibitions and screenings include Kassel Dokfest, Kassel; Marl Media Art Award, Marl Museum of Sculpture, Marl; Celeste Prize, ASSAB-ONE, Milan; Neither Here Nor There, FotoFocus Biennial, Cincinnati; Centralia, South Kiosk, London (2014); Aesthetica Short Film Festival, York; Night Contact, Contact Editions, London (2013); CAPITAL, George and Jorgen Gallery, London and London Calling: Tehran, 7Samar Gallery, Tehran (2012). Her work has been discussed as part of the 2012 Brighton Photo Biennale symposium Visible Economies: Photography, Economic Conditions and Urban Experiences and published in collaboration with Photoworks and University of Brighton. Charles was recently awarded a Jerwood Visual Arts Project Space commission, RCA Travel Bursary, Villiers David Bursary Award and Christopherson Foundation Grant.